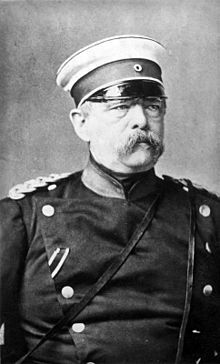 Prince Otto Eduard Leopold von Bismarck-Schönhausen, Duke o Lauenburg (1 Aprile, 1815 – 30 Julie, 1898) wis a weel-kent German aristocrat an statesman o the 19t century in Europe. As Prime Meenister o Proushie frae 1862 tae 1890, he wis maistlins responsible for unitin the monie unthirlt German kintras an for foondin the German Empire in 1871. He became the first chancellor o the new Empire. He wis Graf von Bismarck-Schönhausen (Coont Bismarck-Schönhausen) in 1865, syne 1871 Fürst von Bismarck (Prince Bismarck) an syne 1890 the Herzog von Lauenburg (Duke o Lauenburg). At first he didna want the teetle o duke, but he teuk it later onywey. Bismarck wis gey conservative an he wis weel connectit tae the monarchy. He wisna a big uphauder o democracy. His maist important ettle wis tae mak Proushya stranger an he won that throu the unitin o Germany. Bismarck ettelt tae hinder the socialist muivement an tae reduce the pouer o the Roman Catholic Kirk. Ae road tae hinder socialism wis tae mak the warkin-cless mair content. He did that bi introducin monie social reforms lik public halth an accident insurance, as weel as pensions for auld fowk. "Law is like sausage: Gin ye're tae respect it, it's nae guid peyin ower muckle tent tae the wey it's pitten thegither." Wikimedia Commons haes media relatit tae Otto von Bismarck.